View cart “Goin’ Home Fine Art Print” has been added to your cart. This was originally painted for a calendar on angels. They were a little skeptical when I presented a dog-angel painting. But it turned out to be their most popular one to date. 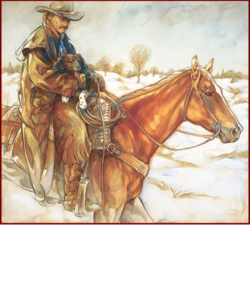 It was a second in time caught when our friend Jake was helping my husband feed horses in the barn one morning. He adored our dog, Bingo. Jake is all grown now, and our beloved Bingo is gone. By My Side touches the heart of anyone who has loved and lost and wished for one more day. 15" x 17" fine art print of original acrylic/watercolor painting. Fade resistant inks on high quality acid-free archival paper. 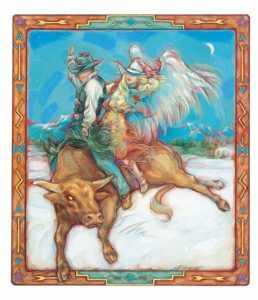 This was originally painted for the December page of a western calendar. Goin' Home is a portrait of my husband and his favorite working dog. It is about life on our cattle ranch and the quiet satisfaction after a long day; a portrait in essence of the lifestyle we have chosen. The painting is based in watercolor with acrylic glazes. 18" x 20" fine art print of original watercolor/acrylic painting. Fade resistant inks on high quality acid-free archival paper. 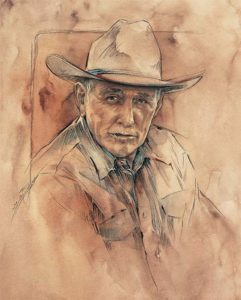 Some of Ray's great quotes: "My whole life is the horse" "The horse knows when you know and he knows when you don't "The horse is never wrong" "Trust your horse" "It's amazing what you can learn when you've already learned all there is to learn" I can still hear him clearly, and miss him everyday. I was proud to call him my friend. 15" x 18" limited edition signed & numbered fine art print of original watercolor/pencil painting. Fade resistant inks on high quality acid-free archival paper. This is signed by Ray Hunt and by the artist, Susan Edison. Originally used for a calendar on angels. 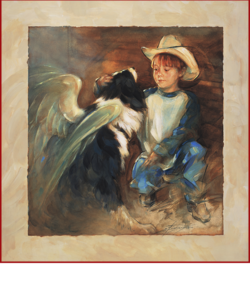 Workin' Overtime depicts a Bull-riding cowboy at his most vulnerable, but he is shielded from harm in the loving embrace of his guardian cowgirl angel riding companion. 14" x 16" fine art print of original acrylic painting. Fade resistant inks on high quality acid-free archival paper.